I've got a quick and easy gift idea for classrooms, teachers, friends and more today. 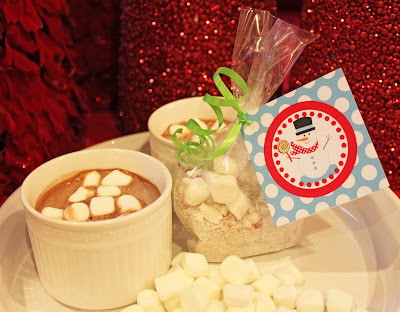 Homemade hot chocolate with some mini marshmallows and peppermint -- yum! Put the first 4 ingredients in a very large bowl and stir and then stir some more. Now take all of your candy canes (without the wrappers!) and put them in a ziploc and crush them up. Make sure to leave a few chunks so that they look pretty for presentation. Now take your small plastic bag and add about 5 tablespoons of hot chocolate mix. Next add a few marshmallows and then some crushed candy cane. 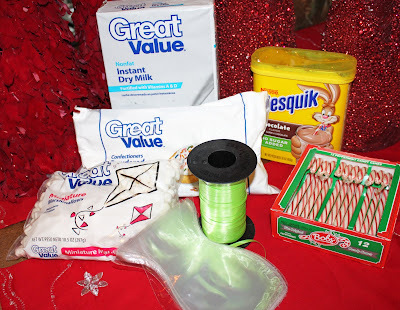 Use your curling ribbon to tie the bag off and add your gift tag... the one I've shown is from the Shindig Parties TO GO Let it Snow Collection. I'm making 90 of these today for my kids' classes and it's going pretty quick -- what a fun and EASY idea. And by the way my new friend, Kirsti, is hosting a giveaway of the Let it Snow Collection of printables on her Blog -- the giveaway will run until December 20th so hurry on over there and sign up! It's a great collection -- you can see more photos from it here. Wow you really met it when you said big bowl!